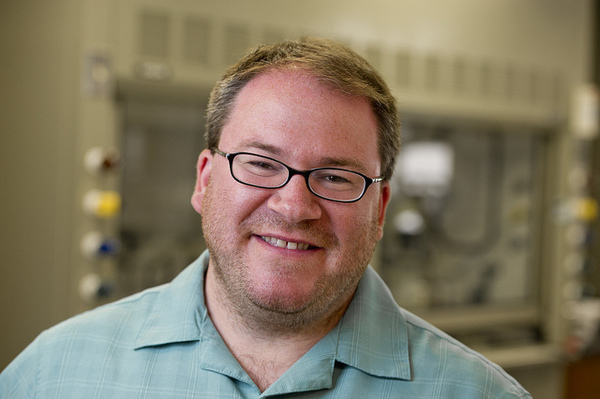 Steven Corcelli, associate professor of chemistry and biochemistry, has been appointed to serve on the editorial advisory board for the Journal of Physical Chemistry. He will serve on the advisory board until 2018. Corcelli’s research interests are broadly focused on the dynamics of biomolecules, and his research team is currently working on several projects in this field. One current project is focused on characterizing the water dynamics at DNA interfaces. While it is well known that water is essential to the stability and function of biomolecules, its specific role in biological processes such as protein folding and reaction mechanisms, is not fully understood. Another current area of study is focused on understanding the solvation dynamics in ionic liquids. Ionic liquids are of great interest because they are environmentally-friendly alternatives to volatile organic solvents. Using methodologies developed to studying solvation dynamics in complex biological environments, Corcelli aims to understand the motions present in ionic liquids and how they influence more stable and preferential solvation and reactivity. Published by the American Chemical Society, the Journal of Physical Chemistry has four editions – A, B, C, and Letters. Issued weekly, A is focused on the chemistry of molecules; B specializes in material chemistry, thermodynamics and biophysical chemistry; and C highlights nanostructures and electronics. Letters, the newest edition of the journal is published twice a month and covers all area of physical chemistry. Originally published by Stephanie Healey at science.nd.edu on October 01, 2015.